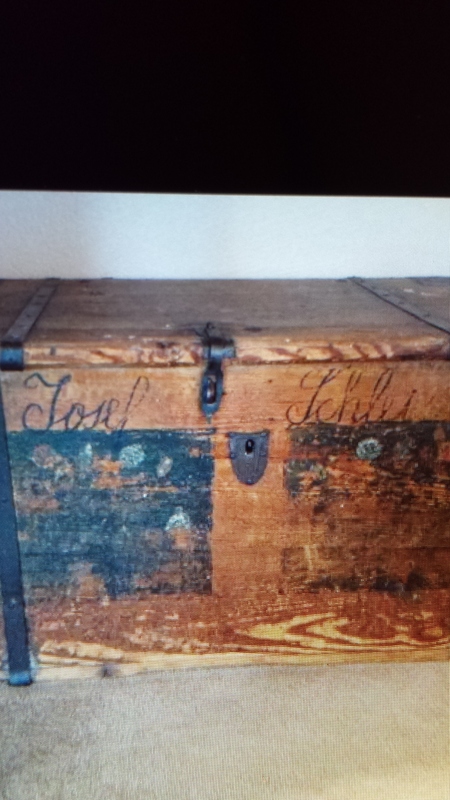 Wooden box brought by Josef Schliess when he and his family immigrated in 1868. Now in the possession of one of his great great grandchildren. This entry was posted in Uncategorized and tagged Joseph Schleiss on March 19, 2015 by kwriter13. It has been a while since I made a posting. Life changed for me and my siblings when we lost our beloved Father two days after Christmas.This will be my last installment (for now anyway) on the extended Meyer/ Uelmen family. Next I will turn my attention to my fraternal side of the family. Place: a village somewhere in the Pilsen region of Bohemia (now the Czech Republic). Eleven year old Maria Schleiss skipped home on the way she noticed the men, who came every year telling of the good fortunes to be had in America, had returned. They made her think of her uncle who lived there. She had never met him but from time to time he wrote letters glowing with the reports of the good farmland. and the ease of obtaining citizenship. Two years ago, after Prussia had begun to occupy their country, her aunt Barbara’s family had joined him. Maria thought the place was called Wisconsin. Her mother and father had discussed going with them but lacked the funds to make the move. Maria hadn’t minded she wasn’t so sure she wanted to move to a strange place so far away, even if they did have family there. Once home Maria opened the door of her house. How strange, her parents and two older sisters were sitting at the table even though it wasn’t meal time. Her father held a letter and another piece of paper. Seeing Maria her sister Catherina jumped up. “Uncle Prausa has sent us a bank draft. We are going to America.” From that moment on Maria’s life would never be the same. The next weeks and months were busy ones. Very little could be taken along so most of their property needed to be sold or given away. Finally the day had come for final tearful good-byes. Maria looked longingly at the village she’d been born in and the friends and family gathered to say good-bye. With tears in her eyes she to took one last look and then turned and left her life in Bohemia forever. The family made their way to a train station where they boarded a train that would take them to Bremen (now in Germany). There they boarded the ship Gessner for the voyage to America. Below is the ship passenger record for the Josef Schleis family. The ship Gessner departed from the port of Bremen and arrived in NY on July 15, 1868. Josef’s occupation is listed as a weaver. Like the Uelmen and Meyer families they most likely made their way to Northwestern New York where they boarded another boat that would take them across the great lakes to her uncle in Kewaunee county, Wisconsin. Since Kewaunee borders Lake Michigan they were probably met by family or were able to arrange for immediate transportation to Katherina’s family in Carlton township. 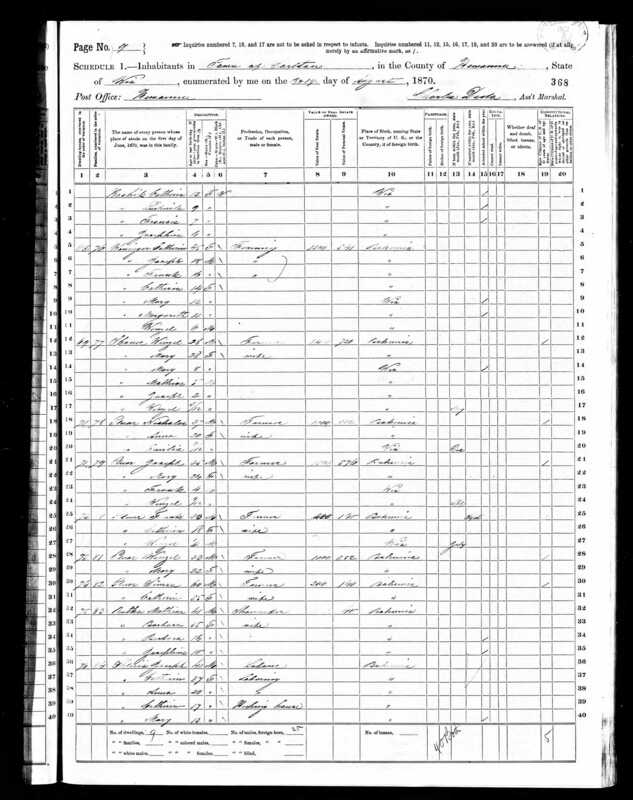 In 1870 the census, shown below, shows the family living in Carlton Township of Kewaunee county. Josef and his wife are listed as laborers. Directly above his listing is one for Katherina’s sister Barbara and her husband Mathias Rutka. 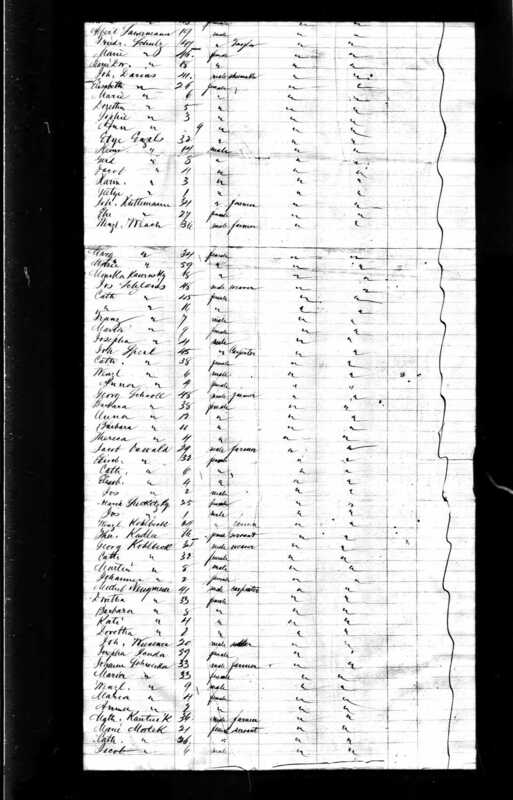 The Shleiss family carries over to the next page where child Frank, age 11 is listed as well as a new child, Theresia, age one. Also on this page is Katherina’s brother Josef Prausa. 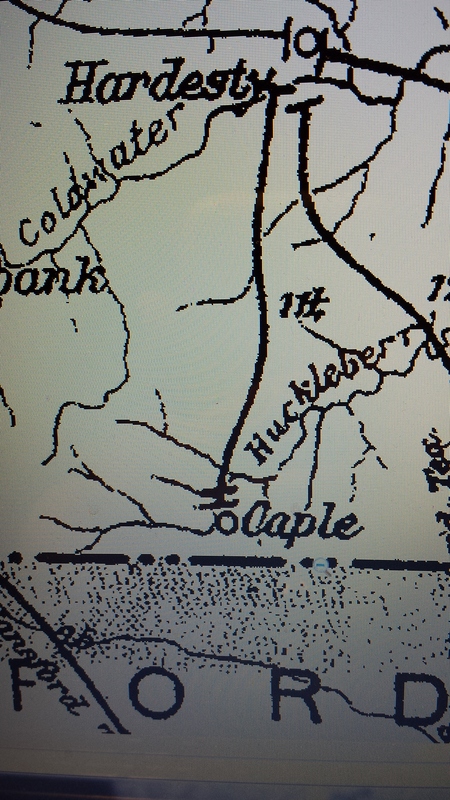 The 1880 census shows the family is still living in Carlton township. Joseph is now listed as farming. Maria is no longer living with the family as she married Peter Ulemen in 1877 and was living in Auburn township, Fond du Lac county. In 1896 Maria’s mother, Katerina died and is buried in St. Joseph’s cemetery, Norman, Kewaunee County, Wisconsin. Her father, Josef is found living with his son Frank in Carlton township, Kewaunee county. He died died in 1908. From The Kewaunee county Enterprise News from Carlton. Mr. Joseph Schleiss an old resident of the town died last Saturday night after a short illness. The deceased was 89 years old and buried in St. Joseph’s cemetery. Mr. Schleiss moved to this county from Bohemia forty years ago. He is survived by three daughters and one son. notes: Although I have no absolute proof that Joseph Prausa and his sister were Catherina Prausa’s siblings the evidence for it is strong. Maria’s children said her uncle Prausa provided the money for their passage to America. There are no other Prausa’s living in Kewaunee county during the time period of their immigration. Joseph Prausa had emigrated about 1855 giving him time to save enough money for the family’s passage. Further more they are found living within close proximity of each other in both of the 1870 and 1880 census. This entry was posted in Uncategorized and tagged Bohemia, Carlton township, Catherina Prausa, Joseph Schleiss, Kewaunee county, Maria Schleiss Uelmen, Wisconsin on March 17, 2015 by kwriter13.